Winter isn't an "occasional fill-in until it's warm enough to cut grass" afterthought for Levanduski Snow Removal Sevices LLC. At our Snow Division, year-round professionals approach the challenge of cold weather with the same scientific zeal we bring to warm weather grounds maintenance. Cold weather is serious business to us. We make sure pedestrians and motorists at corporate headquarters, industrial parks and residential projects we serve are able to move as safely as possible. When winter skies open up we're always there, often at a moment's notice. In addition to our in-house snow crews, when an unusual weather system hits, we bring in carefully vetted subcontractors (who are directly supervised by one of our professionals) to supplement our snow and ice removal efforts. Where's the Levanduski science in snow and ice removal? It starts with a plan. We thoroughly evaluate each client's property, identifying pedestrian and motor vehicle areas that need special attention. We map out removal tracks and make sure that the proper ice-removal chemicals, and environmentally friendly non-chemical traction products are in stock and ready for application. 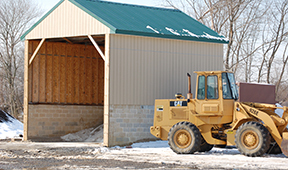 Proper planning, preparation and execution make the difference at Levanduski Snow Removal Services LLC. How committed is Levanduski Snow Removal Services LLC to winter grounds management? Our staff knows that earned time off and winter vacations must be pre-empted when they are needed to fight snow, frozen rain and ice.